$10 Smashbox Photo Finish Primer Dupe?! The Smashbox Photo Finish Primer (the original clear one) is a cult favorite amongst the beauty community. I do love this primer myself, but it is really expensive for a product that you typically use almost everyday. If you are unfamiliar with Trader Joe’s stores, it is a neighborhood-style grocery store with specialty items from their own brand. Everyone always raves about Trsder Joe’s, but I have never heard anyone talk about their skincare line. In my opinion, their skincare products are extremely underrated and this Antioxidant Serum for $10 is no exception. When I first used this serum, I noticed right away that the thicker consistency was pretty much identical to the Smashbox primer. This is because both products have a main ingredient of dimethicone. The TJ serum also contains grapefruit extract as an added bonus. Grapefruit is very high in Vitamin C and helps to plump the skin and blur fine lines over time. This serum applies very smoothly and sinks into the skin quickly, so it won’t feel like you have a layer of primer sitting on top of your skin. For me, the Trader Joe’s serum is a near perfect dupe for the Smashbox primer and I am so happy that I stumbled upon this amazing product! I use it mostly as a makeup Primer, but sometimes I will apply it when I’m not wearing any makeup to give my skin a smoother appearance. I find that this serum makes my makeup last just as long as the Smashbox primer and allows my makeup to go on smoothly overtop. I prefer this serum over the Smashbox Primer because, 1) it smells like grapefruit (but the smell does not linger) and 2) it is only $10 versus $36 for the Smashbox one. 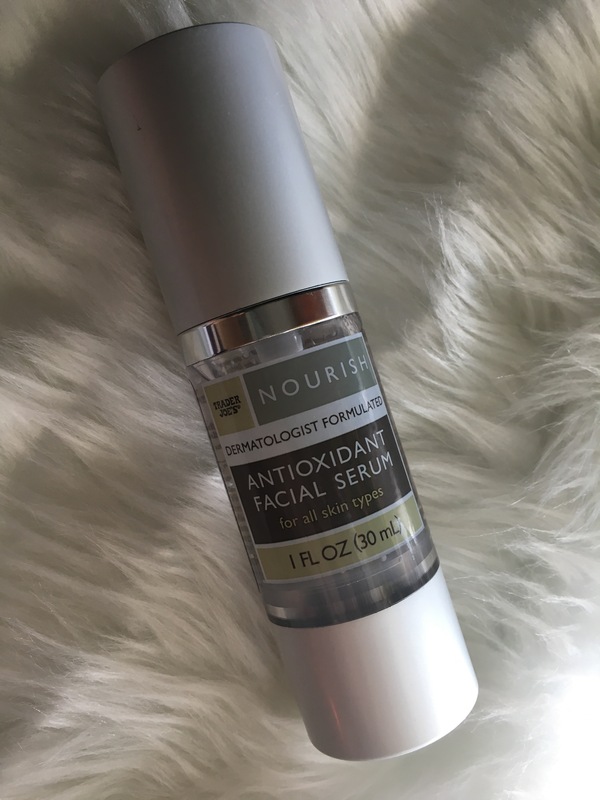 I highly recommend this serum and encourage you to try out the other products from the Trader Joe’s Nourish skincare line! I bought mine at a TJ store, but you can also find it on Amazon. Added tip: The oil-free Antioxidant moisturizer is hands down my favorite and perfect for any skin type! Miracle Product for Acne Scars! Pity we don’t have the store here in Germany! The product sounds very good. I am using a primer from The Skin Chemist at the moment and I think is just as good! I went out and bought it last night. It’s so awesome and now my favorite moisturizer/primer/thing to make my face feel nice. Thanks for the recommendation! Awesome! Glad you like it! I actually googled smash box trader joes serum because I was pretty sure they were similar products and the first ingredients are the same. I’m wondering though, do you find that your foundation stays on as long with the Trader Joe’s serum? I feel like maybe mine doesn’t. I’ve never tried them side by side, but for me the Trader Joe’s serum keeps my makeup looking good for 8 hours, which is the longest amount of time I typically have the same makeup on. Foundation does break up around my nose, but it doesn’t matter what primer I use.